It's time to head to the bookstore, people. Rachael Ray's newest cookbook, Yum-o! The Family Cookbook, releases today. Not only will you have a new source of Rachael Ray recipes, but you'll also be helping Rachael's charity, since all the proceeds go to benefit her Yum-o!. Rachael founded the charity "to help kids and adults develop a healthier relationship to food and cooking." 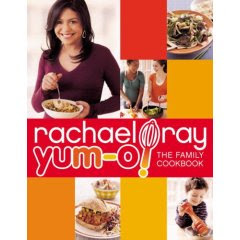 According to the book's description, to further the purposes of Yum-o!, Rachael put together this "ultimate family cookbook, which includes recipes that both kids and their parents will love cooking–and eating–together!" The recipes use "more whole grains, use less fat, and make the most of fresh fruits and vegetables so they are as good for you as they are delish, and they’re all quintessential Rachael–fun and creative." once, then eat twice or more. I'm planning an expedition out of the house today to get my hands on a copy. Consider yourself as having done your good deed for the day when you go buy it, since Yum-o! does great work for kids' health.